The 2007 British Virgin Islands Sailing Regatta and Festival was my first sailing race. It was spectacular. The Caribbean Seas and the Atlantic Ocean became the most spectacular playground I ever had. I was a kid fulfilling a childhood dream. But I had to be an adult as well to undergo the rigorous certification programs of the U.S. Sailing Association. 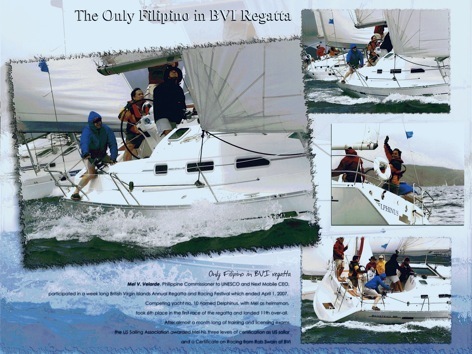 Not only that I was the only Filipino in the regatta, I was also able to complete three levels of certifications plus a bonus training certificate on competitive racing. You would have a clear sense of my pride as I share these achievements with you. I had long felt that the sea, the boats, the wind and the waves are my long lost childhood companions. I realize sailing is a passion I’ve been longing for — which I now truly enjoy. There’s nothing like being in the middle of the ocean. I spent hundreds of sailing hours, sometimes with no land on sight, always in proximity to real danger. Any moment a squall or storm could occur that would cause accidents on the boat or create disasters as we sail away. The lives of everyone are potentially always in danger. These eventualities do happen — so sail with utmost care. As they are not strong enough reasons to give up one’s passion for the sport, having to acquire the skill of sailing is a — non-negotiable — must; for it is our first level of defense. When you are in the middle of the ocean, you are closer to God. In HIS company, one could truly enjoy the best that nature could give. So fair winds to you, my fellow sailor.